Queensland Premier Annastacia Palaszczuk and Federal Opposition Leader Bill Shorten talk about addressing inequality inside the Queensland State Conference of the Labor Party in Townsville. Yet one of the greatest drivers of inequality is climate change driven by fossil fuels and coal mining. 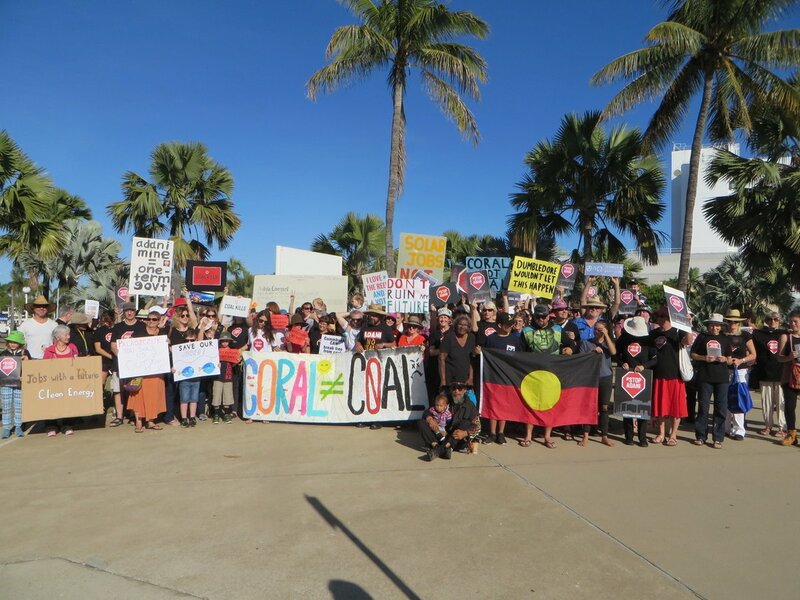 Outside the state convention about 200 people turned up on Saturday morning to press the point that developing more fossil fuels, especially the Adani Carmichael coal mine, will further drive climate change. Climate change is a driver of political destabilisation, food insecurity, and inequality at a global level. Queensland's commitment to 50 percent renewables by 2030 and zero emissions by 2050 mean little if coal and gas is continued to be exploited and exported overseas. Politicians often say that if we don't export it , then some other country will. But this is an immoral defence, with this justification known as the Drug Pusher's defence. That's what Premier Palaszczuk is arguing: an immoral case that if Queensland doesn't drive climate change by exporting coal, then some other nation will do so. But even the Drug Pusher's defence for developing the Adani mine falls flat when you take into account there is a global energy transition occurring, and the global coal market is in structural decline. Developing any new coal mine risks becoming a stranded asset, failing at plain economics. Developing a new mine like Carmichael is also likely to displace coal production and jobs in Queensland's Bowen and Surat basins and NSW Hunter basin coal mines. So even on the jobs creation argument for Queensland, the Adani project is likely to be zero net gain. “Make no mistake, Adani’s proposed mine is a disaster for the world’s poor. More coal will drive more people into poverty through the devastating consequences of climate change and the direct toll of coal burning on local communities. “More coal will not help bring electricity to those in India and worldwide who currently live without it. Renewables are the clear answer to increasing energy access, raising incomes and employment, tackling inequality and driving inclusive social and economic development. “India knows this, and is rapidly scaling up its clean energy ambitions to meet the challenges of climate change and secure energy for all. It plans to end coal imports in the very near future. “Adani still needs to raise finance for this disastrous project. The Federal Government must rule out public funding for the mine and commit to no further coal mines in Australia, coupled with greater support for renewable energy plans in developing countries. “Oxfam Australia’s report published recently, More Coal Equals More Poverty: Transforming our world through renewable energy (PDF), highlights the devastating human cost of coal and climate change on vulnerable communities worldwide. This state conference is the opportunity for the 183 local Queensland ALP branches to submit motions for state policy consideration. But at least 3 proposals from local branches on the Adani Carmichael coal mine will not be put to the vote. The Agenda Committee decides what motions get presented to state conference. The Queensland Labor secretariat Agenda committee of the Queensland state conference has taken care to exclude any branch motions regarding Adani from the formal agenda. 1. Exploitation of coal deposits … will contribute to global warming. 2. Any new jobs created … will be far outweighed by the jobs lost in the Queensland tourism industry. 3. The Adani mined coal will be destined for a rapidly shrinking external market in coal. 4. Taxpayer support for uninvestable new coal projects … is not only a bad idea but diverts public funds from other urgently needed infrastructure projects. That the Government be asked to reconsider its commitments to and fast-tracking of the Adani Carmichael Project. That no financial governmental support of any kind be handed to the developers of the Adani mine. That the Government embrace the economic reality of a global decline in the use of fossil fuels in the post-industrial 21st century and create sustainable employment for the future and for regional Queensland in the agricultural, tourism and renewable energy industries. This conference does not support the Queensland Government decision to declare Adani’s proposed Carmichael coal project as critical infrastructure. The Government’s decision overturns due process and gives the Coordinator General power to make decisions around the project. The recent coral bleaching was a consequence of climate change and was a warning signal that needs to be heeded. The burning of coal is the greatest contributor to climate change. The mine does not meet the Government’s definition of critical infrastructure. Bill Shorten was there to open the conference campaigning on inequality while sitting on the fence on Adani. The official Federal Labor line on Adani is not to support a federal government subsidy through a Northern Australian Infrastructure Fund (NAIF) loan to build a railway line to the coast. But the Palaszczuk state government has already given Adani a subsidy in unlimited groundwater use and deferral of royalties.